Home NewsDoes your qualification match your experience? Does your qualification match your experience? The processing and manufacturing sectors are fortunate to employ many people with extensive experience in Lean Manufacturing, Six Sigma, Theory of Constraints, TQM and other business improvement processes. While these processes and systems are recognised within their industries, they are often not recognised by a formal external qualification. 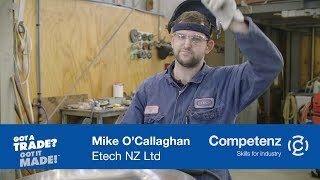 John Stephens, Master Lean Six Sigma Black Belt from New Zealand Aluminium Smelter (NZAS) who has significant skill in both Lean Manufacturing and Six Sigma training decides to get qualified. He contacted Jacqui Lyders from Competenz to find out if he could get qualified for his extensive experience. The request resulted in John achieving a Level 4 Certificate in Competitive Manufacturing – Facilitators Strand, in recognition of his in-house experience. The alignment process resulted in nationally recognised qualifications for NZAS operational teams.